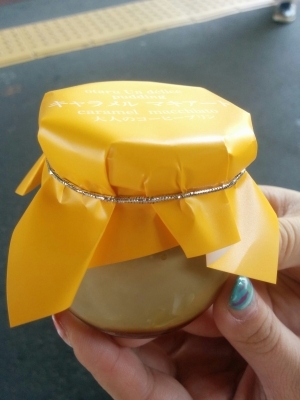 I advise anyone staying at MorinoKi to visit the nearby pudding cafe Undelice. Puddings galore. You'll find yourself overwhelmed with pudding choices, and your heart filled with pudding dreams. Reach this Mecca, and you can fill your mouth with pudding delight. Browsing through the bakery selection at the supermarket, there were many familiar faces - croissants, donuts, éclairs - all appropriately named. 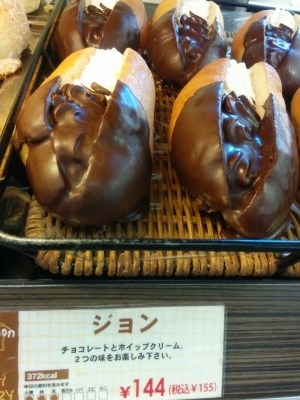 However, among them, for some unknown reason this cake was called ジョン (John). I cannot describe the surreal disturbance caused within one's soul when one sees a cake with their name on it. Why did this one cake have a human name? Another mystery of the universe has revealed itself. Japan is a safe country but the skies are dangerous. A murderous predator is above your head. Crows are big, black and hungry - and they will stop and nothing to satisfy their instinctual desires. Never eat outside - a crow will find you. It will rally up the troops, they will swirl overhead like a slow, spiraling tornado, and take your food against your will. 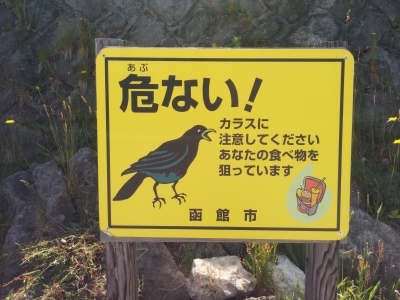 You may think you are safe here, but stay on guard, at any second their could be a beak in your face. 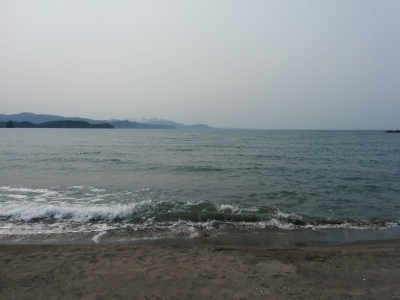 I cycled to Shioya to check out the beech - which is probably a lot more inviting in Summer. I was crazy (or stupid) enough to go in the water (which everyone else had the sense not to) and of course got completely frozen in the 2 minutes I could stand it for. The best part is that Mt.Yotei can be seen from here! It's the first time I've been on a beech where there is a snowy mountain in the background! This will be a recommendation in the future but best waiting until the weather warms up. 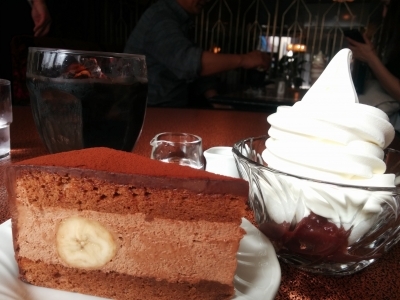 Today we went to a cafe called "amatou" in the pedestrianised shopping area of Otaru. The interior was a little dated and this reflected the approach to the food offer - I'm told that the taste of the cakes was closer to the style of 50 odd years ago, and more similar to the strong rich taste as in the west - whereas in recent years in Japan the cakes have become much lighter and less sweet. Anyway, it's a recommendation in any case! 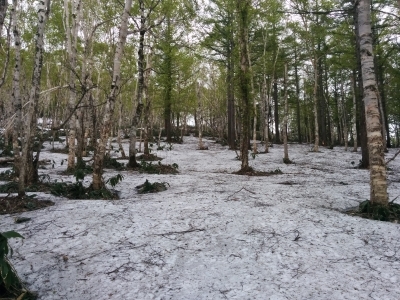 In saying that - I tried to do the previously mentioned long hike from shioya myself (which I had previously done one summer) this time parts of the trail were covered in snow and it was impossible to tell how to proceed! I ended up getting extremely lost and arriving at a waste processing plant with huge trucks passing by on a muddy road. I eventually got (kind of) back on track and walked on a tarmac road to the top of tenguyama and then back to otaru. Its a great trail but word of advice, get the map cached beforehand and use GPS! 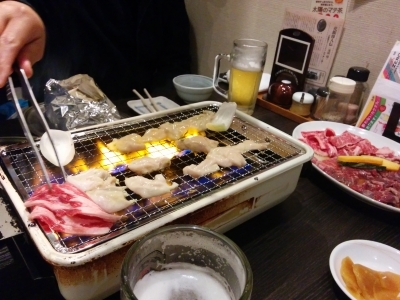 Another Otaru Beer event! This time at Zenibako! 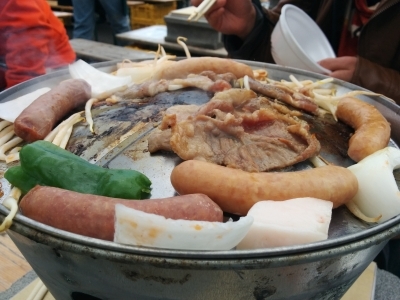 Very nice friend atmosphere which everyone was eating jingis kan and drinking litre glasses of beer. Everyone seemed to be enjoying themselves and it was a completely family friendly atmosphere. I can't imagine how this kind of event would have turned out back home! Tengu yama! 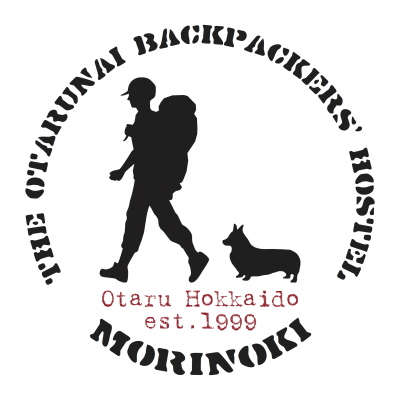 Walking distance from central Otaru and very quick to climb (because it's so steep) or there is a ropeway if you are that way inclined. 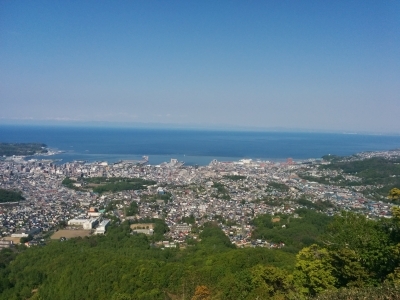 If you enjoy mountain climbing and have a full day - I would recommending taking a train to shoots, then.climbing maruyama and making your way round to tenguyama - there are several peaks and it allows for a grand return into otaru when the hiking is over! 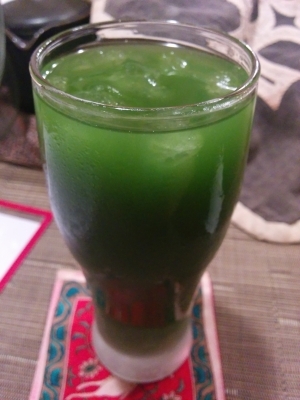 I also had the pleasure of drinking in " kaze no Aji" or the flavour of the wind! The owner seems to be a local celebrity - he talked to customers throughout, slowly preparing specialities and drinks such as maccha sake at his own pace. At one point he even played us a commercial which he started in on a TV screen.